Why Vigorun Forehead Ear Medical Temporal Thermometer? LEADING TECHNOLOGY FOR EXCELLENT PERFORMANCE Vigorun temporal thermometer is backed by clinical studies and recommended by medical professionals. To deliver reliable results and ensure excellent performance, we apply the updated high-accuracy sensor probe and the latest smart chip. It is faster, more reliable and safer. MULTI-MODE THERMOMETER The digital thermometer is designed for all ages, adults, infants and elders. It not only supports forehead or ear function, but is able to take room/object temperature. and are easily switchable. INTELLIGENT LIGHT INDICATOR & 35 SETS OF MEMORY Intelligent light indicator & 35 sets of memory: Equipped with fever warning system, the thermometer for fever will indicate temperature status with corresponding lights and beeps. 35 sets of readings are recorded for better tracking the changes of body temperature. BEST THERMOMETER FOR BABY 1 second fast measurement with instant reading, plus mute mode, just take the temperature without wake your baby up. You can read it clearly even in the dark with a large backlit LCD screen. RISK FREE All well-selected materials and components to ensure the safety of users. All Vigorun products will be backed by our 60-Day No-Quibble Money Back guarantee policy and 18 months Replacement Warranty, support 7*24h technology service. All you need to do is to send us an email directly at the buyer center or contact our customer support. We will respond within 8 hours normally. 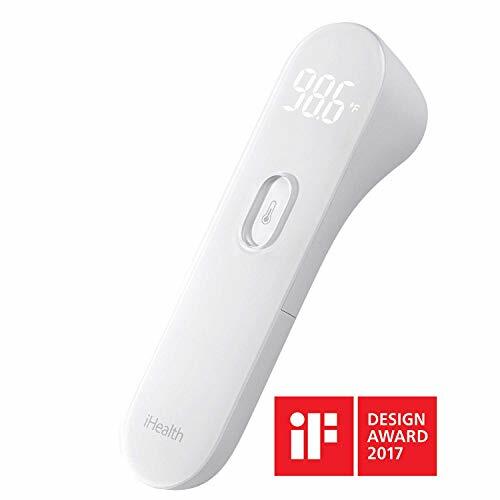 iHealth Thermometer PT3 is an infrared No-Touch forehead thermometer that gives you 1-second testing to know the current body temperature of someone you care. ->High precision: ultra-sensitive infrared sensor measures IR energy emitted from the forehead and collects more than 100 data points per second. ->Fast testing in just 1 second, get reading instantly. ->Safe & Hygienic. No-Touch design, non-invasive measurement. ->Gentle vibration to alert when a reading completed. No annoying beeps. ->Hold. Aim. Press. Only 3 steps to test, easy for self-measurement. ->Readable at night with LED backlit. Plus, iHealth Thermometer PT3 is built-in with distance sensor to avoid invalid measurement and also built-in environmental sensor makes necessary adjustments for an accurate reading. How to change the unit? 1.When the device is powered off, press and hold the measurement button for 8 seconds to enter unit switching mode. Under this mode, both Fahrenheit and Celsius should flash at the same time. 2.Under this mode, press the measurement button to switch to Fahrenheit or Celsius. The corresponding symbol of the selected unit after switching will flash. 3.After selecting the unit, press and hold the measurement button for 8 seconds to leave the unit switching mode. FAST & EASY: Digital Medical Infrared Forehead Thermometer suitable for Kids,Toddlers, BabyBaby and Adults. Just Hold. Aim. Press. Only 3 steps to test, fast testing in just 1 second, easy for self-measurement. ACCURATE & RELIABLE: Ultra-senstive infrared sensor collects more than 100 data points per second from the forehead. The additional distance and environmental sensors make necessary adjustments to give you accurate readings. SAFE & HYGIENIC : No-Touch design, Non-invasive measurement and No need probe covers. Totally safe for children to use. CLEAR LED DISPLAY : Invisible when not in use, a large backlit LED screen displays the reading in bright white light. See it clearly even in total darkness. GENTLE VIBRATION to alert when a reading completed. No annoying beeps. High-cost vibration motor built-in for better user experience. The pediatrician-recommended Bluetooth Digital Thermometer that's as simple, accurate & reliable as other leading digital thermometers, but does much more.Kinsa QuickCare is a much-appreciated gift for adults with or without children. This smart thermometer takes accurate oral, rectal & underarm temperature readings. It keeps each family member's health details in your pocket for you or your pediatrician and offers personalized guidance on what to do if someone is sick.Kinsa works with all Android phones running 5.0 or above and all iPhones running iOS 10 or higher.Cleaning: Soft cloth or cotton swab with up to 75% alcohol. Water resistant, not waterproof The battery life is more than 600 measurements, or approximately 2 years if used every day. Accurate Temperature With A Gentle Forehead Scan. Gentle stroke of forehead captures naturally emitted heat from skin over temporal artery . Red LED lights and soft beep indicate correct scan. Takes 1,000 readings per second, selecting the most accurate. Arterial Heat Balance computes the correct temperature. Directly connected to the heart via the carotid artery. Has the constant blood flow needed for accurate measurement. Safest, most convenient, and comfortable place to measure temperature. Taking temperature with an oral or armpit thermometer will not be easy with a struggling toddler/kid or a crying baby as the readings take too long to show. After finally putting baby to sleep, the beeping sound wakes your child and all your efforts are wasted! We understand the anxieties and worries that you face when your child is sick. It can be very exhausting to constantly to monitor your sick baby's temperature. We feel you! Why DrKea Ear and Forehead Fever Thermometer? Large Display & Buttons: See readings clearly, elderly friendly design. Silent Mode: Stay in ninja mode when taking temperature of a sleeping baby or toddler. Color Warning Guidance: Red indication when there is fever and green when temperature is normal. Easy To Use: Toggle between modes, Fareiheit and Degree Celcius Readings easily. Secured Probe Cover: Prevent Probe Cover from going falling off and going missing. Room Thermometer: Ensure that baby is sleeping in a comfortable room temperature for baby's well-being. Use this function to measure baby's milk bottle temperature for the perfect feed. Memory Function: Save up to 20 readings Mom's Choice: Trusted by mommies for its baby-focused functions to be the best baby care kit. FDA Approved: Our Baby Thermometer is FDA and CE Approved. Clinically tested and recommended by Doctors. ACCURATE & RELIABLE - Our highly reliable and accurate ear and forehead thermometer gives you a fast 1-second reading of your babys temperature. Our tri-mode advance infrared thermometers are built to give you an ease of mind. Highly recommended by Pediatricians and Medical Professionals for it's reliability and easy to use functions. EASY TO USE - Our Baby Thermometer is best suited for home use, with no complicated set up, just use it upon opening. Toggle between ear, forehead and room temperature with just 1 button, and clear icon indication to show you the function selected. Switch between Farenheit and Degree Celcius Readings easily by holding the MEM button for 3 seconds. 30 DAYS MANUFACTURER'S MONEY BACK GUARANTEE - We offer you a hassle free 100% FULL refund if you are unsatisfied with our product. This is how confident we are of our quality product. Absolutely NO RISK for you! Click the Add To Cart Button to get yours now! MONITOR BABY'S FEVER EASILY - We understand that monitoring your baby's fever can be very exhausting with a fussy and crying baby, that is why, we use the ear and forehead function to take quick readings without making baby uncomfortable with oral or armpit thermometers. LET YOUR CHILD SLEEP PEACEFULLY - Just when you have finally put your fussy baby down to sleep, the silent mode function will ensure that you can still monitor your sick baby without waking him/her up. Unlike other thermometers that will only keep beeping with fever indication, our thermometers show Color Indication as well for fever warning. An advanced infrared thermometer for household health care, a professional essential tool for clinic and baby family at any time, anywhere. - 5 in 1 function, to measure the temperature of the ear, thermometer, an object like the room, water, milk. Thus, you can get a wide range of applications and functional diversity. - Apply the latest infrared scanning technology, the updated algorithm as well as the smart chip for the best accuracy. - Silent mode is specially designed for no bothering sleeping baby or noisy kids. It also comes with LCD backlit for easy reading even in the dark. - One key to switch body temperature/ object temperature for convenient and practical use, especially for the new user and when you in anxious. - Quick reading, it only takes 1 second to get temperature precisely. - 35 groups of reading memory storage and recall, you can track the history records easily, therefore, the data comparison is within your reach. - Fever alarm with clear light indicator. Green means normal temp, yellow means light fever and the red light means you should take the tester to go to the hospital immediately. - With / switch setting for your prioritized choice. - Automatic shut off in 60 seconds if no operation to save battery and its service life. - Easy to clean the probe and machine body, just need you softly wipe it with a clean cloth. The Best Hobest Thermometer for Kids and Adults! reading with 1S. Bring the best care for your family. What Can Get From Hobest Baby Thermometer? 1s Instant accurate reading time. Adjustable measure unit in / . Multiple Mode:Forehead Mode /ear Mode / home temperature/ object surfacemeasurement mode. Fever alarm with red backlight and short beep. Auto shut off in 30 seconds to save the batteries life. 20 groups data storageand recall for track the trend of body temperature. High sensitive infrared sensor and precise probe to ensure accurate reading. Large LCD display and backlight indication for identify the temperature in dark environment. turned off, press the "MEM" button for 6 seconds then release. the higher value as the measurement results. used in household or fixed places only. Quick and Accurate The highly sensitive and precise sensor provides an accurate and instant reading in seconds. Clinical Tested and FDA Approved--enough professional and reliable to be chosen to care your families' health. 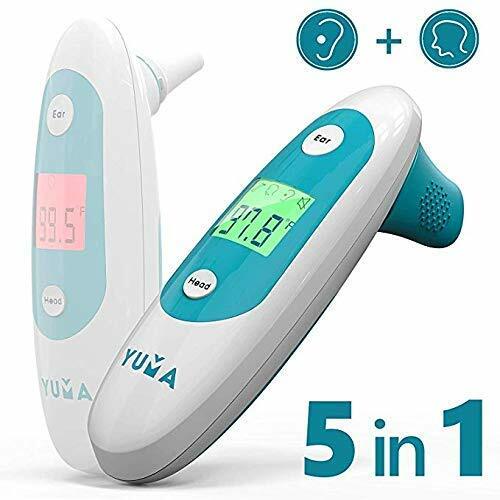 Multi-Mode Thermometer Easy to switch from forehead to ear detection mode through pushing the button; suitable for all ages. Moreover, this thermometer could be used to tested the object as well, such as the temperature of milk bottle, baby bath water, or nursery room. Large Backlit LCD Display Screen Humanized design with backlit screen makes it easy to read the test results without disturbing the asleep kids even at night; free to switch the temperature readings between Fahrenheit and Celsius as well. 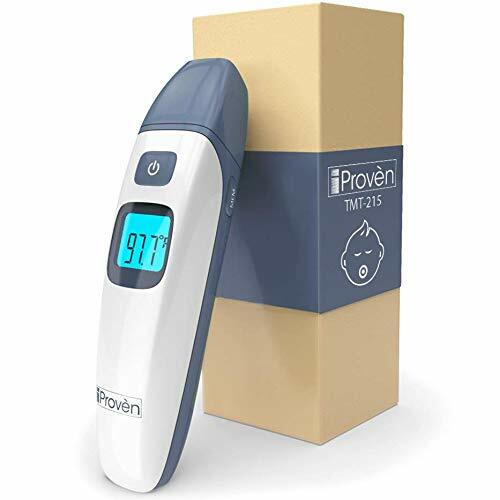 Fever Warning This infrared thermometer will automatically beep alarm with red light to warn having a high fever if the test temperature exceeds 38 /100.4 . 20 Times Memory Recall Store and Recall up the latest 20 times test results for the better track of body temperature changes. Delivers temperature readings with unfailing accuracy and fast speed. The new Braun No touch + forehead thermometer is gentle enough for a sleeping baby. 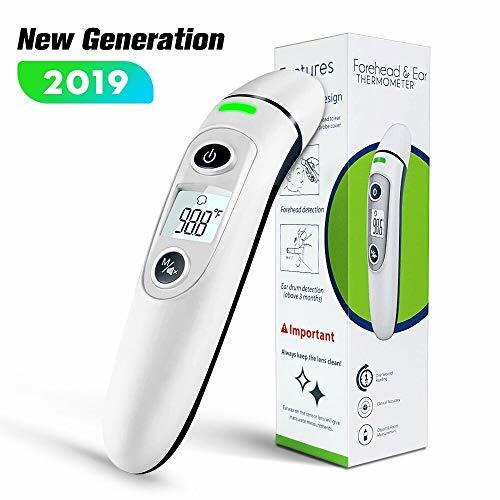 With its revolutionary dual technology and ultra-sensitive sensor, now you can get fast and precise temperature readings either in touch mode, by placing the thermometer on the forehead, or by holding it in front of the forehead up to 5 cm away in the no-touch mode. Silent mode for sleeping baby. You've found the must-have thermometer for every family. In times of runny noses and feverish foreheads, you need a thermometer you can trust. Thanks to the clinical calibration technology, our thermometer will give you consistent and accurate measurements time after time. As a mom, you want to give your feverish little one as much sleep as possible. After all, sleep is the best medicine. What if you want to keep monitoring the temperature without waking up your baby? With our thermometer, you can do just that. The backlit display will light up red if a fever is detected. This makes it incredibly easy for you to take your kid's temperature in the middle of the night. It only takes a swipe across the forehead to measure the temperature. Quick and easy; just like that. Your kiddo can keep on dreaming peacefully. Our promise Why wait? Order our thermometer today without any risk. We promise that you will enjoy the quality and simplicity of our thermometer OR get a hassle-free refund within 100 days of your purchase. THE ESSENTIAL THERMOMETER IN EVERY HOUSEHOLD - The perfect thermometer for all ages. 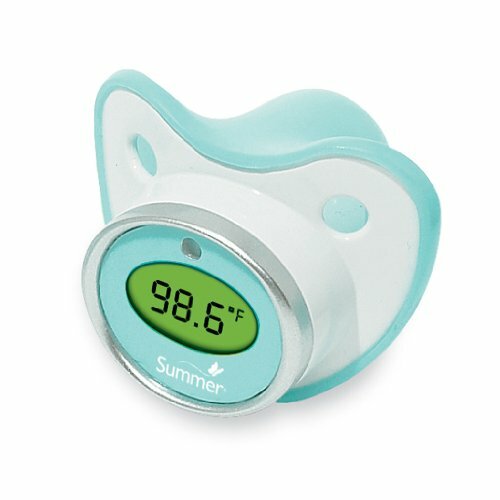 Measure your infant's temperature with a quick swipe across the forehead. Your little one will never notice-even while sleeping! ADVANCED MEDICAL TECHNOLOGY - Our thermometer delivers a fast measurement with consistent accuracy thanks to our tried-and-true calibration technology. INTELLIGENT FEVER ALARM - The display will light up red if a fever is detected. You will know immediately if your kiddie's temperature requires immediate attention. DUAL MODE - Using Ear Mode will give you a reading in only one second. Or try Head Mode-the most convenient way to measure your temperature in three seconds. A must-have for the entire family. OUR 100-100 POLICY - Order today, and you're protected by our 100-day, no-questions-asked, money-back guarantee. Our customer support team is ready to go the extra mile with you! Provide soothing comfort while taking baby s temperature. The Pacifier Thermometer s convenient Fever Alert glow feature allows parents to get a nighttime temperature reading without disturbing baby. A protective cover is included for travel and clean storage. Measuring water temperature in the bathtub and room. Not only a thermometer, but also a clock. Temperature display is in both Celsius and Fahrenheit. Press + and - at the same time to switch between Celsius and Fahrenheit. High and low temperature alarm, safe and accurate thermometer flashes and beeps when water is too hot or too cold. ABS/PVC environmental protection material and Plexiglas material, BPA free, 2*LR44 batteries included. Make a comfortable bath temperature for your baby. "Works great, easy to use!" "Accurate reading every time!" "Clear instructions" "Comes with batteries!" "Perfect, love it!" QUESTION: How to take forehead, ear measurement? How accurate is this? ANSWER: Our dual thermometer is very easy to use. Quick scan across forehead to get instant reading. Remove probe cover for ear function, no disposable covers or filters required. Easy enough for adults to remove yet sturdy enough to be safe for kids .It's trusted by mom and pediatricians. QUESTION: I don't have time to figure out how to use, does it come with batteries and instructions? ANSWER: YES! It's ready to use out of the box with 2x AAA batteries installed for you, just remove power strip to activate device. It comes with an easy to read and follow 5-step quick-start guide with images, start using it in minutes! QUESTION: Is there silent mode? Is this product good for children and adults? ANSWER: Yes! When the device is on, hold the lower button for 2s to turn sound on / off. It's a forehead and ear thermometer for kids and adult with same settings. It can keep track of 35 temperature readings, perfect for the whole family! QUESTION: Why should I choose yours over others on Amazon? ANSWER: We've listened to the market and created an amazing product! It's not only easy to use and accurate, we've include some free accessories you will love! It comes with a standing dock for home use, cleaning cloth and travel pouch which protect against dusts and damages wherever you go! Our gift box looks stunning and is perfect as a gift. QUESTION: Does it come with a money back guarantee in case I don't like it? ANSWER: YES! You risk nothing. Our thermometer is backed by an unconditional 100% 1-year, money back guarantee. Your search for "the ONE" perfect thermometer is over! We have limited supply. Grab yours today. EASY TO USE AND ACCURATE - High precision infrared sensor provides instant and accurate reading every time. CE and RoHS compliant top grade thermometer with clinical accuracy. Trusted by moms, pediatricians and medical professionals. SILENT mode with LARGE, BRIGHT LCD, easy to read in the middle of the night when babies and kids are sleeping. 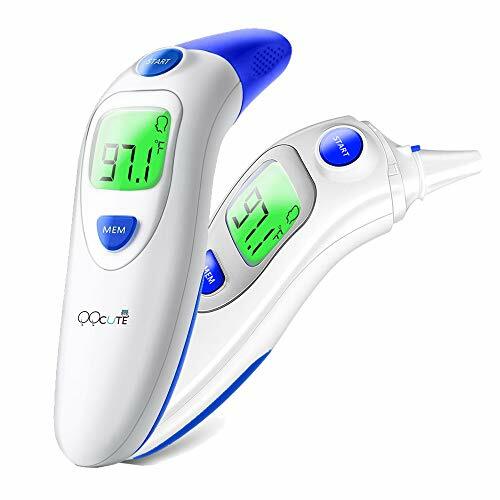 If you have wiggly baby or toddlers child who find it invasive in the ear, you can use the Ocodai ear and forehead thermometer for quick forehead swipe measurement. Accurate Fever alarm Tri-color indicator to detect light and heavy fever. Keep Track of up to 35 temperature readings of your children. Free to switch between fahrenheit and celsius. Suitable FOR ALL AGES. 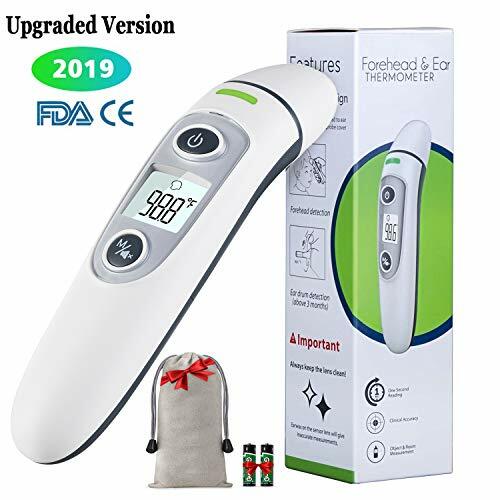 If you're looking for a new professional thermometer that is READY TO USE RIGHT OUT OF THE BOX, then this is perfect for you because it comes with batteries installed for you with a bonus easy to follow quick start guide with images so that you don't need to figure out how to use it. Moms loves that it has a travel bag and small cleaning cloth because it's portable and takes up little space in the diaper bag and can keep it in the best condition, perfect for daily on-the-go use. 4-IN-1-MODE - FAST and EASY switch between forehead to ear detection mode. Easy for moms to monitor their own temperature. This thermometer can detect and test object and room ambient temperature with no touch, such as heated milk bottle, baby bath water and nursery room. 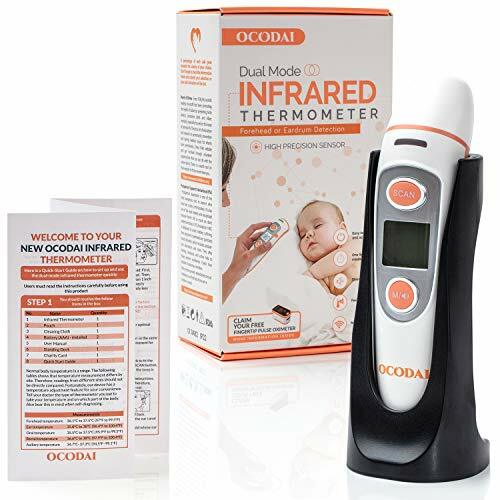 If you're looking for the PERFECT BABY SHOWER GIFT for your friends, family and co-worker, the Ocodai dual function thermometers is a gift they will LOVE and is reliable. It comes with a FREE standing dock for easy storage that looks amazing as gifts for display, it also protects against dusts, scratches and damages which means that your thermometer will last forever. QQCute Forehead thermometer with function delivers instant, accurate results with a press of a button. Using safe, infrared digital sensor technology, QQCute is changing the way you take temperature of loved ones at home whether they are awake or asleep. This thermometer is designed for HOME USE ONLY and is not intended to take the place of the advice provided by your own physician or other medical professional. Immediately contact your health-care professional if you suspect you have a clinical issue. RELIABLE AND ACCURATE. Clinically tested and proven to be reliable and accurate when used in accordance to instructions. FEVER ALARM. Red backlight display and 10 short beeps to warn the patient that may have a fever. Pain-free Measurements Having a feverish baby or toddler can be a challenge already. Let alone if you have to measure their temperature. With our non contact thermometer, you will know your little one's temperature in just seconds, without them even noticing. Silent measurements - so you can let your baby sleep Our thermometer will tell you what's going on, without waking up your baby. Just use the mute switch. The display will light up red or green showing you if your little one has a fever. So you know what's going on, even in the middle of the night. 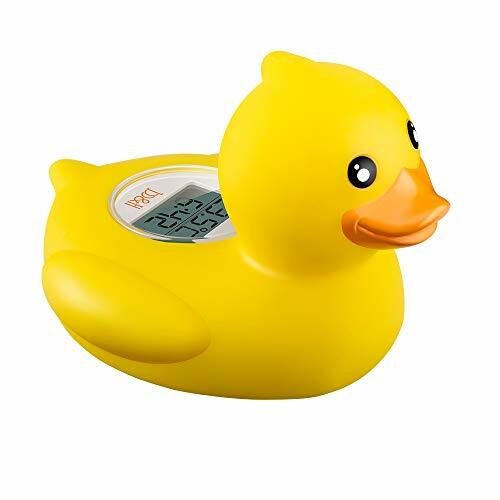 Check the temperature of your baby's Room, Bottle & Bath With the object mode you'll never have to wonder again if your baby's room, bottle or bath is too hot or too cold. Click the button and you'll know the answer in just seconds. Order your thermometer now, so you have it ready when you need it most. We promise that you will enjoy our Quality, Education and Simplicity OR get a Hassle-free refund within 100 days from your purchase. ALL YOU NEED AS A MOM OR DAD - This thermometer not only measures your baby's temperature via the ear or the head. It can also show you if baby's bottle or room is too hot or too cold. PEACE OF MIND WITH CONSISTENT RESULTS - Thanks to advanced clinical testing, this thermometer will give you consistent and accurate readings. Just follow the easy instructions in our manual! TAKE YOUR BABY'S TEMPERATURE WHEN HE'S ASLEEP - The mute function allows you to take your little one's temperature without waking him up. KNOW WHEN TO TAKE ACTION - The display will tell you if your little one has a fever. It will light up in green or red, depending on the measured temperature. TOO HOT OR TOO COLD? - As a parent, you're going to ask yourself this question like a million times. Not just when it comes to a fever. I'm talking Bottles. Rooms. Baths. The third mode of our thermometer, the object mode, will give you the answer. In just a second. 1) Please keep infrared thermometer out of Children's reach. 2) Keep it away from water,the infrared thermometer is not waterproof. 3)It is NORMAL to get the variations between Oral (0.5 to 1.0 F), Forehead (0.3 to 0.5 F)and Ear measurements. This is NOT due to the inaccuracy of the thermometer. 4)Ear test mode is only suitable for children over 3 months. It is normal to obtain a slight variation. 5)Please read the included instruction manual carefully to avoid any misuse and keep it for future reference. Multiple Mode Forehead Mode suitable for all the ages;ear Mode (recommend for child above 3 month),home temperature/ object surfacemeasurement mode. Clinical Accuracy and Reliability Equipped with the most advanced medical infrared technology for quite accurate reading, FDA approved. MONEY BACK GUARANTEE AND WARRANTY Our top priority is your satisfaction. We still offer a 30-day 100% Hassle free money back guarantee. In addition to this you are covered by the 1 year manufacturer's guarantee. This thermometer allows you to check your baby's temperature without touching their forehead. It gives you results in just a second, so your little one won't even notice what you're doing. ... and for you as a parent! Want to check your baby's temp while he's asleep? The mute function allows you to do so without making any noise. The colored display will immediately show you how serious the fever is. This thermometer is all you need when you want peace of mind without waking up your baby. This thermometer has been calibrated for best consistency and accuracy at a distance of 2-6 inch. The different modes allow you to check your body temperature or the temperature of an object or room. TRULY NON-CONTACT: MEASURE AT 2-6 INCHES DISTANCE - This thermometer has been designed to give you real non-contact readings. Even at a distance of 2-6 inches, you can be sure of a reliable measurement. ACCURACY WITHOUT COMPROMISE - Non-contact thermometers are inaccurate? Not so much for this one! It will give you consistent and reliable results, over and over again. MEASURE IN COMPLETE SILENCE - This thermometer can be switched to mute, so you won't wake up your baby if you take a measurement when he's asleep. KNOW HOW SERIOUS THE FEVER IS - The display lights up in green, orange or red, depending on the measured temperature. Showing you how serious the fever is - even in the dark! NOT JUST FOR YOUR BODY TEMP - This thermometer has been specially calibrated to measure not only the temperature of a forehead but also of an object or a room. No more wondering whether your baby's bottle or bath is too hot or too cold! A smarter instant-read thermometer from AOKON can help you accurately measure temperatures in just a single second. 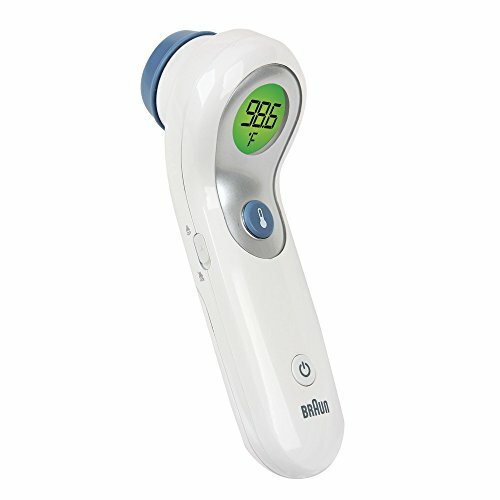 When your baby is sick and you need a safe, effective way to monitor their temperature without making them uncomfortable, nothing provides faster, more accurate results than with a AOKON Ear and Head Thermometer that uses infrared technology to ensure you always stay one step ahead of changing conditions. 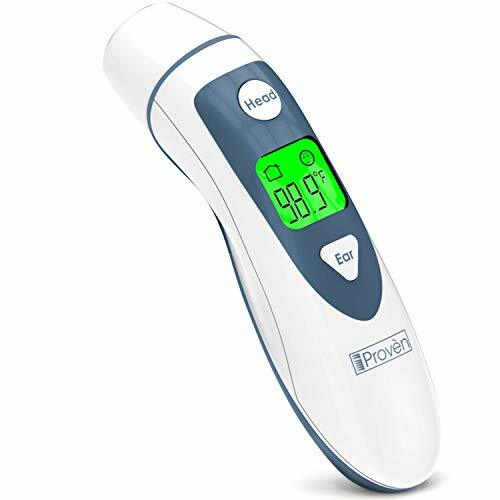 These 5-in-1 medical thermometers can be used to measure fever temperatures, check bath water or warming bottles, and ensure food is safe, making it ideal for home, travel, nursery, or caregiver use. A smarter, more effective design for babies and parents, our digital thermometer can read forehead temps with a single pass or you can remove the cap on the front and check the inner ear with fast, accurate results. 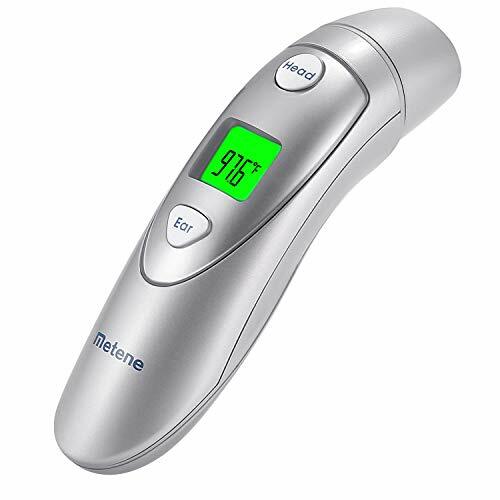 Monitor rising body temperatures and fevers with an advanced ear and forehead thermometer that uses infrared technology for 1-second instant-read results by clicking 'Add to Cart' above to get yours now. 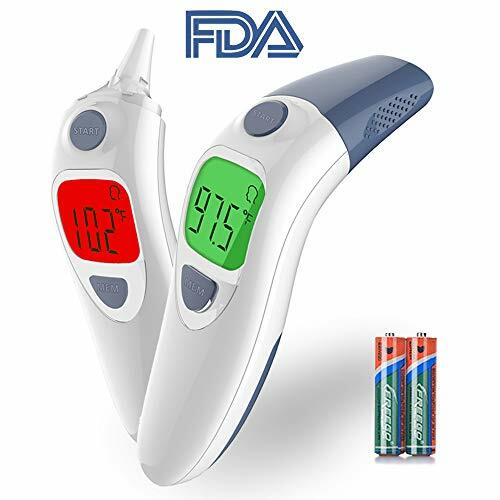 Fast, Accurate Infrared Readings - An advanced digital thermometer that reads ear and forehead temperature, easily monitor liquid, room, object, and basal temps, as well as fevers, with high-accuracy sensor probes with ultimate accuracy. 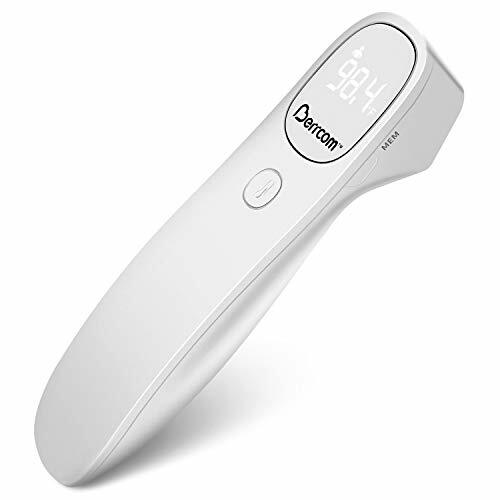 Easy One-Button Touch - Providing parents with more control, we've created the AOKON instant read thermometer with an easy-to-read backlit LCD screen and 1-button touch system that lets you check temps in as little as a single second. Advanced Memory Function - Store and recall up to 35 individual temperature readings to help you provide better care to kids, teens, adults, or seniors throughout the day or over a longer, more in-depth period of personal care. 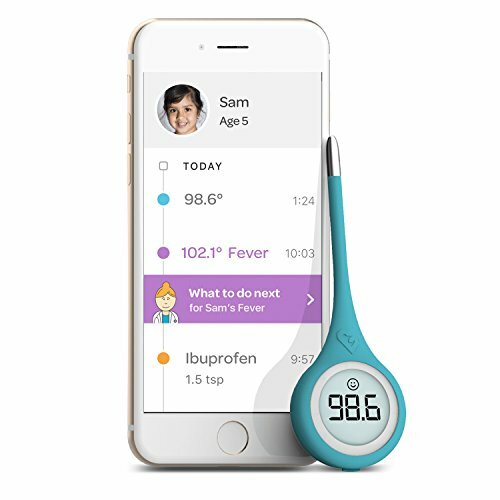 Responsive Fever Alarm - These forehead and ear thermometers can be used in Fahrenheit or Celsius and alert you to when a body temperature is too high or low, making it easier to know when medicines, cool baths, or other support is necessary. 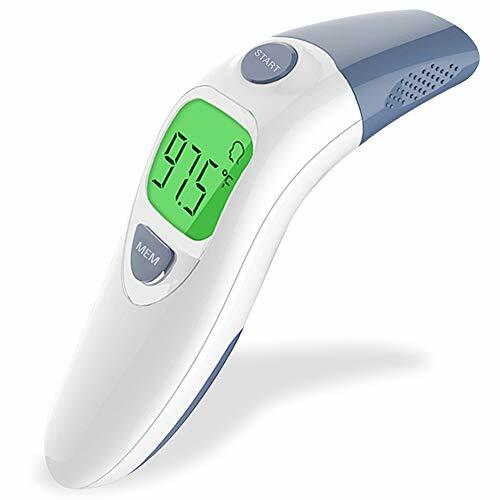 Gentle, Non-Contact Design - Better for newborns, infants, and growing babies, this medical-grade infrared thermometer requires a simple swipe on the forehead or touch inside the ear to give you instant readings with less stress. 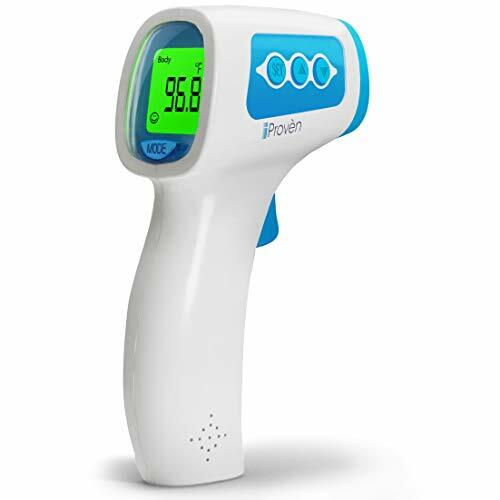 Are you in search for a good quality and accurate infrared digital thermometer? 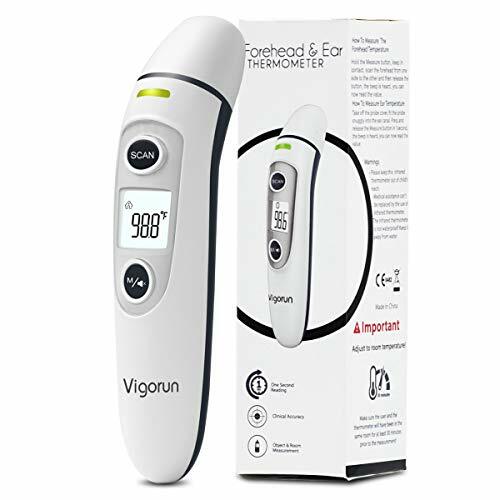 A digital ear and forehead no-contact thermometer that gives fast & always precise results? All this while being completely safe and accurate? Consistent, durable, fast and accurate it s a must-have digital thermometer for any family! Being Clinically Tested, Approved and with CE Certified design, this high-quality infrared thermometer can be used by the whole family. The fast ear or forehead measurements will give fast updates when you or your little ones are feeling sick. On the other hand, the non-contact measurements in silent mode are the perfect way to measure the temperature of a problematic kid or baby. X No more frustration with kids that don t want having their temperature taken in the mouth. Pick between ears or forehead and measure temperature at a glance. What are you waiting for? Click "Add to Cart" now and enjoy quality accurate product.  FASTER & MORE VERSATILE TEMPERATURE MEASURING with the 2018 New 5-in-1 design by Yuma. Measure temperature by placing the thermometer on the ear or forehead, or measure temperature of an object, room or liquids. Pick the right mode & go! 100% SAFE FOR ALL AGES, Clinically Tested, Approved, CE Certified design. Buy one infrared thermometer and use it for the needs of the whole family.  COMPARE UP TO 32 READINGS, our digital thermometer conveniently stores and memorizes each of your readings in Fahrenheit or Celsius. Readings are displayed on a beautiful LCD display. Extra feature: Fewer Alarm (when the temperature is above 100.4 F / 38 C).  BUY RISK-FREE, our laser thermometer comes with a hassle free money-back guarantee and extraordinary customer support for any queries you may have. 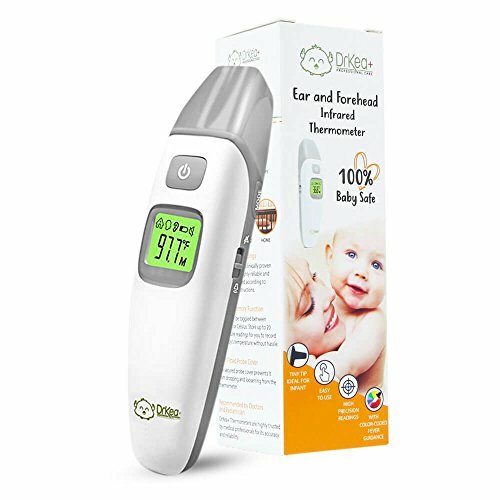 Baby Thermometer -Forehead and Ear Thermometer for Fever- Medical Digital Infrared Thermometer makes the measurement unnecessary to touch the body,you can feel total peace of mind knowing ,Our safe, and accurate thermometer is the solution you have been waiting for. Clinical examination, Measuring sensor technology, safe and accurate. 1 second temperature measurement, convenient simple and quick. 2 modesmeasuring body temperature through forehead or ear. Store 32 measurements to compare body temperature changes. 38 C High temperature alarm, promptly reminding abnormal body temperature.etter understand your physical condition. green for normal, orange for a slight fever, and red for a high fever. Forehead Temperature Readings:Install 2pcs AAA batteries (DC 3V,2pcs 1.5V Type AAA LR03 battery)Press once the Power button to turn it on. Hold the thermometer and point the device to the forehead, then press measurement key directly and keep pressing down while scanning forehead until the buzzer beeps. The temperature will display on the LCD screen. Ear Temperature Readings: Take off the mode conversion cover, and then put on the ear probe cover. Gently insert the probe into the ear. Press the measuring key and hold in ear until the buzzer beeps. The temperature will display on the screen. Note: Make sure that the probe cover is taken off and converted to the Ear and Ambient Measuring Mode. Cleaning: Use a clean soft cloth or cotton swab with a little medical grade alcohol or water to wipe away dirt. 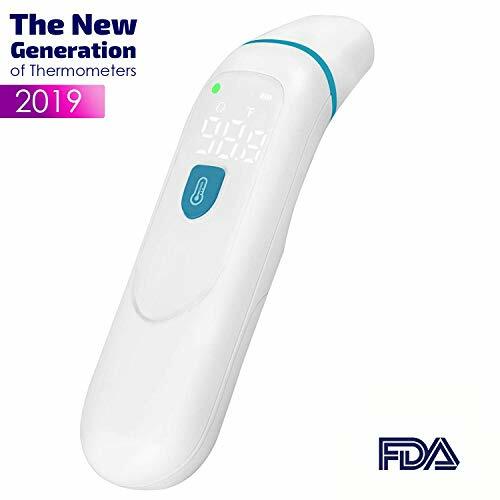 2-IN-1 Digital Thermometer :The FDA and CE-tested forehead thermometer and ear thermometer function, at the same time, can be used to measure the temperature of milk - the easiest and most practical way to measure a temperature. Suitable for family babies, children, adults, the elderly,better control of body temperature to reduce infection and spread of the epidemic. ACCURATE & RELIABLE Our ear and forehead thermometer measures accurate body temperature within 1 second! without making baby uncomfortable with oral or armpit thermometers.thermometer for fever is equipped with the most advanced medical infrared technology and high precision infrared sensor for accuracy and reliability.to give you an ease of mind.Highly recommended by Pediatricians and Medical Professionals. SAFE & PROFESSIONAL : Compared to mercury thermometer, baby forehead and ear thermometer is made of best medical PC+ABS materials. There is no danger of breaking the glass or swallowing mercury, updated high-accuracy sensor probe and the latest smart chip,It is faster, more reliable and safer. Intelligent Humanized Design : The digital thermometer has fever alarm function(forehead and ear temperature exceeds 38 /100.4 ).With 32 readings memory recall for tracking your temperature changes and auto shut off without operation in 30 seconds. built-in a storage shrink bag and English Manual easy to carry Easy to use. EASY TO READ & MUTE MODE : A large HD back-light LCD display own 3 backlight for reading in dark rooms. It has Silent-mode function, will ensure that you can still monitor your sick baby without waking him/her up will not frighten children,offers comfort measurement. 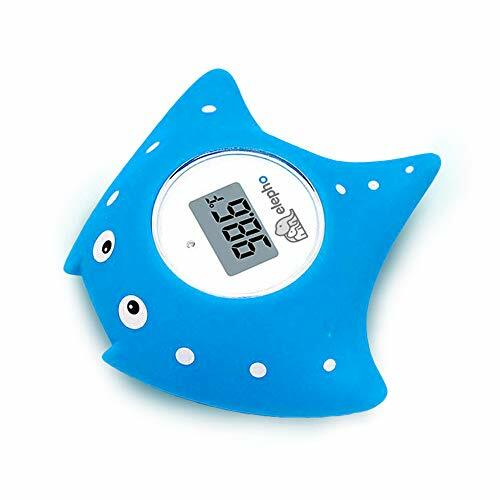 Elepho eFloat Electronic Thermometer for Your Baby s Bath - Helps You Carefully Monitor Water Temperature to Keep Your Baby Safe and Healthy Especially When Bathing. Elepho eFloat Electronic Thermometer for your Baby's Bath - Helps you carefully monitor water temperature to keep your baby safe and healthy especially when bathing. EASY TO USE WITH AUTO ON/OFF FUNCTION - automatically turns on when placed in the bath water; will turn off automatically when not in use. AUTOMATICALLY ALARMS - visual and audio alarm to indicate water temperature range in bath; low battery notification for battery change. CONSTANTLY UPDATING READINGS - provides accurate water temperature readings every five seconds with high and low temperature alerts. SAFE TO USE WITH BABIES - uses safe, waterproof material compliant with toy and safety standards and there are no small parts that pose a choking hazard. FUN, UNIQUE DESIGN - A fun, functional toy for bath time, designed to float in water. 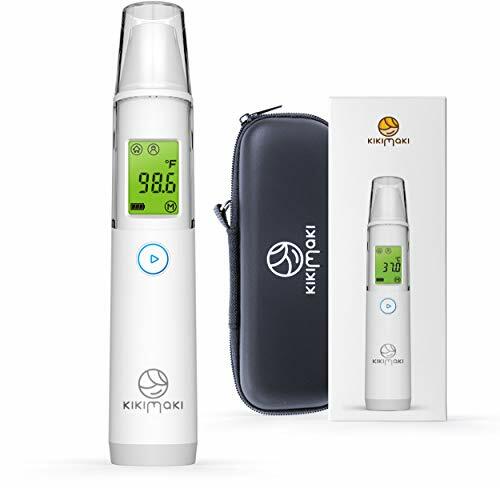 - ANIKUV Medical Forehead and Ear Thermometer,Infrared Digital Thermometer Suitable For Baby, Infant, Toddler and Adults, If you have a baby, you would know the importance of thermometer. 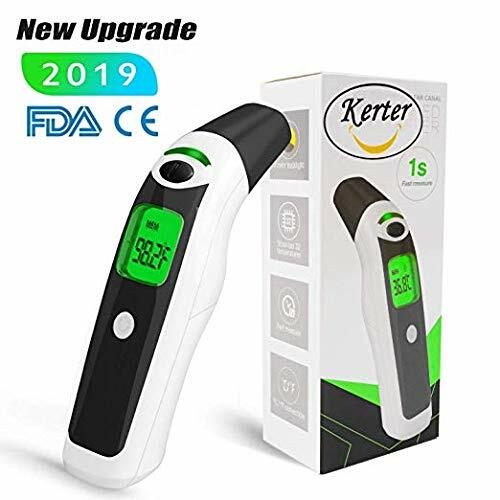 - The 2019 new upgrade infrared thermometer we produced is specially for measuring body temperature, it can free to switch the detection mode from Forehead to Ear which is the easiest and most practical way to take temperature, perfect for medical unit and home use. - Compared to the traditional oral thermometer, mercury thermometer or a digital contact thermometer, it takes non invasive to the utmost level. -When taking the ear temperature for a child aged over 3 months or an adult, gently pull the ear up and back to make the ear canal become straight, so that the probe can receive an infrared ray from the eardrum. 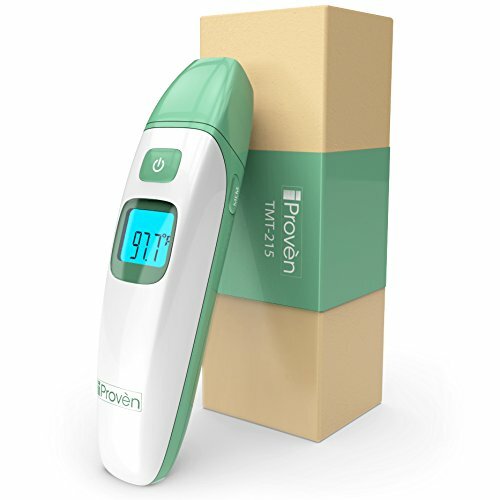 - Fever Warning: This thermometer has preset 37.5 /99.5 as an alarm temperature for low fever. This thermometer has preset 38.5 /101.3 as an alarm temperature for high fever. NOTE: It is normal to obtain a slight variation in temperature readings when taking temperatures from different parts of the body. It is NORMAL to get 32.36 ( 0.2 C) difference between an ear and forehead measurement. This is NOT due to the inaccuracy of the thermometer. Specially for measuring body temperature Professional for Forehead thermometer (for all ages) and Ear thermometer (for kids above 3 months), it can free to switch the detection mode from Forehead to Ear which is the easiest and most practical way to take temperature. FDA Approved. Forehead and Ear Thermometer Features Exclusive LED display screen and the & convertible modes. Apply the updated high-accuracy German sensor probe and the latest smart chip, just take the cover off and easy to switch the detection mode from Forehead to Ear, perfect for medical unit and home use. Thermometer Stores up to 32 Previous Temp Readings It has a large Exclusive LED display screen, you can get readings clearly even in the dark night. To help keep track of the fluctuation of fever temperature, You can easily reflect the tempreature changes to your doctors for making a diagnosis. Easy to Use and Energy Saving Baby Thermometer reads temp instantly with one button operation and read in 1~2 seconds with LCD screen. Easy setup forehead thermometer/ear thermometer is best suitable for kids and adult which has Sound or Mute notification option when reading is done. Energy-saving design, Auto shut-off after 10s. 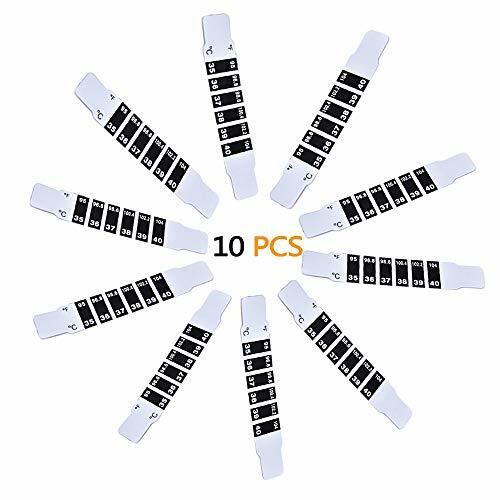 PASNOWFU Instant Read Forehead Temperature Thermometer Strips,Reusable Fever Thermometer Strip,Adhesive Checking Thermometer Strip of Children/infants/adults/elderly people,Measurement Range: 95 to 104 & 35 to 40 ,10pcs. How to check baby's temperature safely and accurately? When you suspect that your baby's sick,you need a Instant Read Forehead Thermometer Strips that we can read immediately to check the child's temperature. Our baby thermometer stickers adopt the principle of liquid crystal change without mercury/latex/battery content. Forehead Temperature Thermometer Strip allows your child to lie comfortably and check his temperature. It avoids the need to repeat the process of starting temperature readings. 1. Accurate readings of fever in children and adults. 2. Wipe the baby thermometer stickers with soap and water to reuse. 3.It is suitable for children to lie down and measure body temperature. 4.Press on your forehead for 15 seconds to show your body temperature. 5.Large LCD display shows green indicating normal temperature, If show the red/tan color at the same time, please deduct 0.5 C or 0.9 . How To Know Whether You Have A Fever Or Not? The temperature of people usually ranges among 97.34 to 98.96 . It is Low-grade fever if your body temperature ranges 99.5 ~100.4 . It is moderate fever among 100.4 102.2 , it belongs to high fever among 102.2 ~104 . And it is very serious if it is higher than 104 and you have to consult your physician . Instant Read : The temperature strips will show the current temp through it's different color variation after 15 seconds,Measurement Range show the Fahrenheit and Celsius ,95 to 104 & 35 to 40 . Easy To Use : Press this fever strips to your kid's forehead to monitor babies' body temperature, and won't effect babies' sleep,some children don't like to have probes the body temperature by their mouths. And our fever stickers just need press on the forehead can monitor the body temp. Convenient To Carry : It's easy to carry even in pockets or small bags. You can Keep them in your home/office/traveling for emergencies.These temperature stickers are the easiest thermometers to check for fevers. Reusable : After use, wipe the baby thermometer stickers with soap and water,and put back into plastic bags to avoid sunlight and heat source. Healthy : Compared with digital thermometers, our baby thermometer stickers adopt the principle of liquid crystal change without mercury/latex/battery content. This Non-contact infrared thermometer is designed for measuring forehead temperature of instant and adult without contacting human body. It can be applied to in household environment or clinic as reference. 1.Special design to take the Human Body Temperature with a 0cm-3cm(0-1.2in) distance from forehead. 3-IN-1 Digital Thermometer This infrared thermometer can measure body temperature ,surface temperature (baby-bottle, bath) and room temperature. Great choice for families (baby, children and adults).Choose which mode do you need for your family. Reliable and Accurate With advantage infrared detection system, the measurement is reliable and stable. Easy to take body temperature at the distance of 0-3cm(0-1.2in) away from forehead. Temperature unit can be displayed in either Celsius or Fahrenheit with the push of a Unit button. Longevity Use & Recording This thermometer has built-in memory which can record last 32 readings taken at anytime. So you have no need to record every time. Longevity use means which you can use it about 100,000 readings. 100% Refund Guarantee 12 months worry-free product guarantee , ensures long-lasting enjoyment of your purchase. Please be free to purchase by clicking the yellow Add to Cart button. This is a professional non-contact infrared thermometer for measuring the temperature of the human body (or objects). Safer and hygienic than mercury thermometer and oral thermometer, convenient and easy to use for baby and children, even at sleeping. You are released from the headache to chase them all the world or to calm them down all the day for a measurement! No disposable probe cover is needed. Simply clean the probe with soft cloth or cotton swab. It saves your cost and our environment. And you don't need to hesitate if you should use the same probe for the second time or not while you are using a traditional ear thermometer! - Make sure no dirt is on the sensor. - Make sure only used in room without sensible wind. - For forehead mode, there shall be no water, sweat or any shade on the forehead. - Make sure no intense emotion and movement before measuring. - If transferred between different ambient temperature, measure after being kept under stable temperature for minimum 30 minutes. - Don't hold your thermometer for long time as it is highly sensitive to heat. NON-INTRUSIVE ACURATE MEASUREMENTS - No more crying and year pinching, we know the hustle, we're parents to and that's why we've made an forehead thermometer, just point the measuring probe 1-2 inches from your baby forehead, press the button and in 1 second you've got your measurement. EASY NIGHT TIME READINGS - Unlike other similar products our baby thermometer has a silent mode when the voice function can be easily turned off to avoid waking up your sleeping baby while taking the Child's temperature. The 3 color LCD display will alert you if the temperature is out of the normal range. QUICK & EASY TO USE - Switch between Fahrenheit ( F) & Celsius ( C), use memory function to recall the last 10 temperature reading allowing you to keep track of fluctuations. Auto Shut Off in 20 seconds when not use to save batteries. Also comes with a BONUS TRAVEL BOX - We know how much parents struggle to stay organized while traveling with babies, that's why we included a portable hard-shell storage case for travel. By the way, our baby thermometer makes a great baby shower gift. UNIVERSAL - Comes with 2 measuring modes, toggle between forehead, and object temperature with just 1 button, and a clear icon indication will show you the selected function. Our digital infrared thermometer can be used to measure a variety of objects temperature, like: baby's milk, food, bathing water, you name it. 1 YEAR MANUFACTURER'S MONEY BACK GUARANTEE - You're 100% Happy or your money back, it's that simple! NO RISK for You, click Add to Cart Button Now!